Purporting to speak for young American Jews, IfNotNow, and other radical organizations are running the #YouNeverToldMe Campaign, accusing Jewish institutions of not sharing the full story of the Israeli-Palestinian conflict. As a Jewish educator, I feel guilty as charged. Indeed, we Jewish educators are guilty of not sharing the full story. This is why I decided to launch the #WeNeverToldYou campaign, for Jewish educators and professionals, to help alleviate this crisis. #WeNeverToldYou that in 1948 just three years after the end of the Holocaust, Palestinians joined a proud campaign that openly declared it wanted a second Holocaust, to annihilate all the Jews between the river and the sea. #WeNeverToldYou of Mahmoud Abbas’s 1982 lecture in Moscow titled The Secret Connection between the Nazis and the Leaders of the Zionist Movement or of his history of Holocaust denial. We, Jewish educators, are guilty. #WeNeverToldYou how to protect yourself. I am reminded of a family friend, Samantha. She didn’t look very Jewish and took the Arab bus from Hebrew University at Mt. Scopus to another location. When the doors closed she suddenly heard whispers. It then got less subtle. A young man came over to her with a threatening tone asking her: ”Are you Jewish?” She said no and got off at the next stop. So young Jews, #WeNeverToldYou that in most places in the Middle East, and in parts of Israel, saying you are Jewish can get you killed. It doesn’t mean it will, but it can. On behalf of Jewish organizations and educators, I apologize to you and Samantha that we didn’t make this much clearer. On behalf of Jewish educators who tried to be too sensitive and impartial, I apologize to young Jews who feel confused and betrayed by the system. We set you up for this. We pretended there were no good guys and no bad guys. This was just some kind of conflict. You now wake up and see the suffering Palestinians have brought on themselves — suffering that is real, serious, and hurting many innocent lives — and say#YouNeverToldMe. True, #WeNeverToldYou. If you would like the curriculum changed, please let us know. 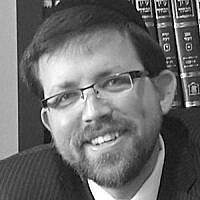 The writer is a rabbi, writer, teacher, and blogger (www.rabbipoupko.com). He is the president of EITAN-The American Israeli Jewish Network and lives with his wife in New York City.